When towing a trailer, incorrect equipment and driving style could cause you to lose control of the vehicle. Towing incorrectly or not observing this Operator's Manual could lead to damage to the vehicle and/or serious injuries. Observe the following guidelines to ensure safe trailer towing. Contact a Mercedes-Benz Center if you need further explanation of the information contained in this Operator's Manual. 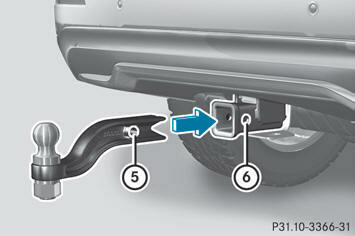 Using a ball coupling other than the one delivered with the vehicle may place too much strain on the trailer tow hitch. This applies especially if the ball coupling in question is longer or angled differently. As a result, the vehicle may be damaged and the trailer may come loose while driving. Handling characteristics may be impaired and the rear axle may be overloaded. This could lead to an accident with serious or even fatal injuries. 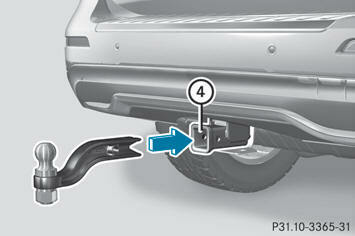 Therefore, please observe the following: - only install the ball coupling delivered with the vehicle. - make sure that the ball coupling is correctly installed and secured before driving. 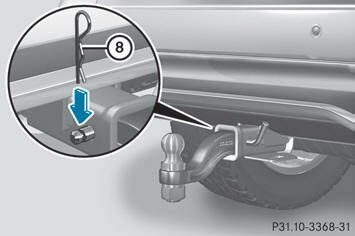 - do not make any modifications to the ball coupling or the trailer tow hitch. When backing up the vehicle towards the trailer, make sure there is nobody between the trailer and the vehicle. Couple and uncouple the trailer carefully. If you do not couple the trailer to the towing vehicle correctly, the trailer could become detached. You will find the applicable permissible values, which must not be exceeded, in the vehicle documents. You will find the values approved by the manufacturer on the vehicle identification plates and those for the towing vehicle in the "Technical data" section. When towing a trailer, your vehicle's handling characteristics will be different in comparison with when driving without a trailer. - is restricted in its acceleration and gradient-climbing capability - has an increased braking distance - is affected more by strong crosswinds - demands more sensitive steering - has a larger turning circle As a result, the handling characteristics may be impaired and you may lose control of the vehicle. This could lead to an accident with serious or even fatal injuries. When towing a trailer, always adjust your speed to the current road and weather conditions. Do not exceed the maximum permissible speed for your vehicle/trailer combination. Never depress the brake pedal continuously while the vehicle is in motion, e.g. never cause the brakes to rub by applying constant slight pedal pressure. This causes the brake system to overheat, increases the braking distance and can lead to the brakes failing completely. Under no circumstances try to straighten the vehicle/trailer combination by increasing the speed. - Do not exceed the legally prescribed maximum speed for vehicle/trailer combinations in the relevant country. This lowers the risk of an accident. - Only install an approved trailer coupling on your vehicle. Further information on availability and on installation is available from any authorized Mercedes-Benz Center. - The bumpers of your vehicle are not suitable for installing detachable trailer couplings. - Do not install hired trailer couplings or other detachable trailer couplings on the bumpers of your vehicle. 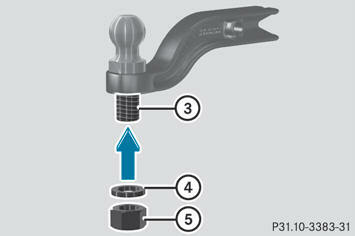 - To reduce the risk of damage to the ball coupling, remove it from the ball coupling recess when not in use. When towing a trailer, set the tire pressure on the rear axle of the towing vehicle for a maximum load; see the tire pressure table in the fuel filler flap. You will find installation dimensions and loads in the "Technical data". The maximum noseweight of the trailer drawbar on the ball coupling is16. However, the actual noseweight must not exceed the value given on the trailer tow hitch or trailer identification plates. The lowest weight applies. Use a drawbar noseweight as close as possible to the maximum permissible noseweight. Do not use a noseweight of less than the minimum permissible noseweight, as the trailer may otherwise come loose. Missing values were not available at time of going to print. Note that the payload and the rear axle load are reduced by the actual payload. Please note that when towing a trailer, PARKTRONIC (Y page 183) and Blind Spot Assist (Y page 198) are only available with limitations, or not at all. On vehicles without level control, the height of the ball coupling will alter according to the load placed on the vehicle. If necessary, use a trailer with a heightadjustable drawbar. Observe the information on ESP® trailer stabilization (Y page 64) and on pulling away with a trailer. The maximum permissible speed for vehicle/ trailer combinations depends on the type of trailer. Before beginning the journey, check the trailer's documents to see what the maximum permitted speed is. Observe the legally prescribed maximum speed in the relevant country. For certain Mercedes-Benz vehicles, the maximum permissible rear axle load is increased when towing a trailer. Refer to the "Technical data" section to find out whether this applies to your vehicle. If you utilize any of the added maximum rear axle load when towing a trailer, the vehicle/trailer combination may not exceed a maximum speed of 60 mph(100 km/h) for reasons concerning the operating permit. This also applies in countries in which the permissible maximum speed for vehicle/trailer combinations is above 60 mph(100 km/h). On long and steep downhill gradients, you must select shift range 1, 2 or 3 in good time. This also applies if you have activated cruise control or DISTRONIC PLUS. This will use the braking effect of the engine, so that less braking will be required to maintain the speed. This relieves the load on the brake system and prevents the brakes from overheating and wearing too quickly. If you need additional braking, depress the brake pedal repeatedly rather than continuously. - Maintain a greater distance from the vehicle in front than when driving without a trailer. - Avoid braking abruptly. If possible, brake gently at first to allow the trailer to run on. Then, increase the braking force rapidly. - The values given for gradient-climbing capabilities from a standstill refer to sea level. When driving in mountainous areas, note that the power output of the engine, and consequently the vehicle's gradientclimbing capability, decrease with increasing altitude. If the trailer swings from side to side: – Do not accelerate. Mercedes-Benz recommends that you have the ball coupling assembled at a qualified specialist workshop. Only a qualified specialist workshop has the necessary specialist knowledge and tools to carry out the work required. You could otherwise incorrectly assemble the ball coupling or tighten the nut with the incorrect torque. 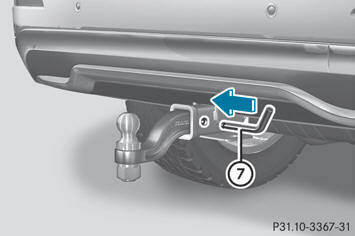 This could lead to the ball coupling and the ball coupling carrier becoming detached while towing a trailer. As a result, you could cause an accident. Therefore, have the ball coupling assembled at a qualified specialist workshop. If the assembled ball coupling has been permanently mounted on the vehicle, have the ball coupling regularly checked for correct installation and torque at a qualified specialist workshop. The ball coupling can be damaged if the nut is tightened on the ball coupling with the incorrect torque. This could cause the trailer to detach while driving and an accident could occur as a result. Therefore, please observe the following: - do not exceed the maximum permitted noseweight of the ball coupling, the trailer coupling and the trailer tow hitch. - when installing, always use a retaining ring between the nut and the mounting surface of the ball coupling carrier. - if the assembled ball coupling has been permanently mounted on the vehicle, have the ball coupling regularly checked for correct installation and torque at a qualified specialist workshop. - check that the thread under the nut is of the correct length. Mercedes-Benz recommends that you only use ball couplings tested and approved for use on Mercedes-Benz vehicles. This helps to avoid damage to the vehicle. Observe the manufacturer's installation instructions if you use a ball coupling other than the one supplied. Also observe the height of the trailer coupling and the trailer manufacturer's instructions. Depending on the height of the trailer coupling, it is possible that the ball coupling will have to be rotated by 180° on the ball coupling carrier for correct installation. The assembly is otherwise identical. – Insert ball coupling 1 through the hole in ball coupling carrier 2 as far as it will go. – Slide retaining ring 4 onto the thread of ball coupling 3 as far as it will go. – Screw on nut 5 as tightly as possible. – With a torque wrench, tighten nut 6 to a torque of 516 lb-ft (700 Nm). – Check that projecting thread 7 has the requisite length of 0.32 in (8 mm) beneath nut 6. – Check the assembled ball coupling for correct installation. If the vehicle/trailer combination is not secured, the trailer may come loose. As a result, you could cause an accident. Therefore, make sure that the ball coupling is secured with the bolt supplied and the corresponding spring cotter. The detachable ball coupling is located in the stowage well under the cargo compartment floor. – Open the cargo compartment floor. – Remove ball coupling 1 with the bolt and spring cotter from ball coupling stowage well 2. – Pull protective cap 3 in the direction of the arrow, out of the ball coupling recess. – Place protective cap 3 into the ball coupling stowage well. – Insert the ball coupling horizontally into ball coupling recess 4 in the direction of the arrow, until the hole in ball coupling 5 and the hole in ball coupling recess 6 align. – Slide bolt 7 all the way into the hole in the ball coupling recess and the ball coupling. – Secure the bolt using spring cotter 8. – Check the ball coupling, bolt and spring cotter for correct installation. If the ball coupling is not correctly installed and secured, the ball coupling and the trailer could come loose. As a result, you could cause an accident. Therefore, please observe the following: RMake sure that the ball coupling is secured with the bolt supplied and the corresponding spring cotter. RIf the ball coupling cannot be correctly mounted, remove the ball coupling. Under these circumstances, the ball coupling must not be used for trailer towing. Have the entire trailer tow hitch checked at a qualified specialist workshop. Vehicles with air suspension program: While you are coupling or decoupling a trailer, make sure nobody locks or unlocks the vehicle and/or opens or closes doors or the tailgate. The vehicle's level could change and you could endanger yourself and/or others as a result. Make sure that you do not operate the ADS switch or the vehicle level control system when coupling/decoupling the trailer. Do not disconnect a trailer with an engaged overrun brake. Otherwise, your hand could become trapped between the bumper and trailer drawbar. Observe the maximum permissible trailer dimensions (width and length). Most federal states and all Canadian provinces require by law: - safety chains between the towing vehicle and the trailer. The chains should be crosswound under the trailer drawbar. They must be fastened to the vehicle's trailer coupling, not to the bumper or the axle. Allow for enough play in the chains to facilitate turning tight corners. - a separate brake system for certain types of trailer. - a safety switch for braked trailers. Check the specific legal requirements applicable to your federal state. If the trailer detaches from the towing vehicle, the safety switch applies the trailer's brakes. Do not connect the trailer's brake system (if featured) to the hydraulic brake system of the towing vehicle, as the latter is equipped with an anti-lock brake system. Doing so will result in a loss of function of the brake systems of both the vehicle and the trailer. – Make sure that the automatic transmission is set to position P.
– Apply the vehicle's electric parking brake. – Vehicles with the AIRMATIC package: select highway level. – Vehicles with the adaptive damping system: set ADS to AUTO or COMF. – Close all doors and the tailgate. – Couple up the trailer. – Establish all electrical connections. Vehicles with the AIRMATIC package: if you couple up a trailer, the vehicle always remains at highway level. When coupling up a trailer, please observe the following: - if highway level has not been set manually, the vehicle will automatically sink to highway level as soon as it reaches a speed of 5 mph (8 km/h). high-speed level is not available. These restrictions apply to all accessories powered through a connection to the trailer power socket of your vehicle, e.g. a bicycle carrier. There are numerous legal requirements concerning the towing of a trailer, e.g. speed restrictions. Make sure that your vehicle/ trailer combination complies with the local requirements not only in your area of residence but also at any location to which you are traveling. The police and local authorities can provide reliable information. - To acquaint yourself with driving with a trailer and with the resulting changes to handling, you should practice cornering, stopping and backing up in a traffic-free location. - Before driving, check: - the trailer tow hitch - the safety switch for braked trailers - the safety chains - the electrical connections - the lights - the wheels - Adjust the exterior mirrors to provide an unobstructed view of the rear section of the trailer. - If the trailer features electronically controlled brakes, pull away the vehicle/trailer combination carefully, manually brake using the brake controller, and check the brakes for correct function. - Secure any objects on the trailer to prevent the cargo from slipping when the vehicle is in motion. - If you couple up a trailer, regularly check the cargo for secure fastening and make sure that the trailer lamps and (if applicable) the trailer brakes are functioning correctly. - Bear in mind that the handling will be less stable when towing a trailer than when driving without one. Avoid sudden steering movements. - The vehicle/trailer combination is heavier, accelerates more slowly, has a decreased gradient climbing capability and a longer braking distance. It is more susceptible to side winds and requires more careful steering. - If possible, avoid abrupt braking. Depress the brake pedal moderately at first, so that the trailer can activate its own brakes. Then increase the pressure on the brake pedal. - If the automatic transmission continues to shift back and forth between two gears when driving up or downhill, restrict the shift range. Select shift range 4, 3, 2, or 1. A lower gear and lower speed reduce the risk of engine failure. - On long and steep gradients that are difficult to drive down in shift range 1, switch to the off-road program or engage the LOW GEAR off-road gear. - When driving downhill, shift to a lower gear to utilize the engine's braking effect. Avoid continuous brake application as this may overheat the vehicle brakes and, if installed, the trailer brakes. - If the coolant temperature increases dramatically while the air-conditioning system is switched on, switch off the airconditioning system. Coolant heat can additionally be dissipated by opening the windows and by setting the blower fan and the interior temperature to maximum. - When overtaking, pay particular attention to the extended length of your vehicle/trailer combination. Due to the length of your vehicle/trailer combination, you will have to travel an additional distance beyond the vehicle you are overtaking before returning to the previous lane. – Apply the trailer's parking brake. Vehicles with air suspension program: As soon as you disconnect the electrical connection between the trailer and the vehicle, the vehicle will lower. To help avoid personal injury, make sure no one is near the wheel housing or underneath the vehicle before the electrical connection is disconnected. When you decouple the trailer, the vehicle is temporarily raised because the springs are relieved of load. Be especially careful during this process, as you could otherwise injure yourself and/or others. Make sure that any persons remaining in the vehicle do not press the switches for vehicle level control or the ADS. – Remove the trailer cable and decouple the trailer. 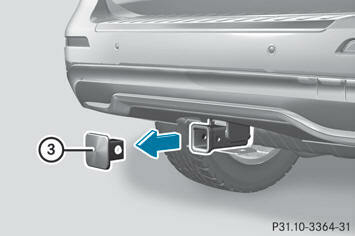 Threshold for Mercedes-Benz approved trailer tow hitches. - When loading the trailer, make sure that neither the permissible gross weight of the trailer nor the gross vehicle weight are exceeded. The permissible gross vehicle weight is indicated on the identification plate on the B-pillar on the driver's side of the vehicle. You can find the maximum permissible values on the type plates of your vehicle and the trailer. Always observe the lowest respective value when determining the maximum weight with which you can load the vehicle and the trailer. - The trailer drawbar load on the ball coupling must be added to the rear axle load to avoid exceeding the permissible gross axle weight. The permissible gross vehicle weight is indicated on the identification plate on the B-pillar on the driver's side of the vehicle. Mercedes-Benz recommends loading the trailer so that the drawbar noseweight remains between 8% and 15% of the permissible gross trailer weight. The weight of additional accessories, passengers, and cargo reduces the permissible trailer load and drawbar noseweight for your vehicle. - To check that the weights of the towing vehicle and the trailer comply with the maximum permissible values, have the vehicle/trailer combination (including the driver, passengers, and cargo with a fully laden trailer) weighed on a calibrated weighbridge. - Check the gross axle weight rating of the front and rear axles, the gross weight of the trailer and trailer drawbar noseweight. – Remove the spring cotter. – Remove the bolt from the ball coupling recess. – Remove the ball coupling from the ball coupling recess. – Clean the ball coupling if it is dirty. Information on cleaning and care of the trailer tow hitch can be found at. Do not carry the ball coupling in the vehicle interior if it is not secured. – Open the stowage well under the cargo compartment floor. – Remove the protective cap from the ball coupling recess. – Press the protective cap into the ball coupling recess until it engages. – Make sure that the protective cap is firmly in place. 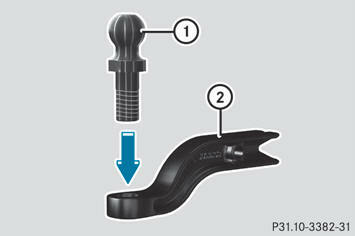 – Store the ball coupling in the ball coupling recess with the bolt and spring cotter inserted. The permanent power supply is supplied via trailer socket pin 4. You can connect accessories with a maximum power consumption of 240 W to the permanent power supply. The trailer's permanent power supply is switched off in the event of low vehicle supply voltage and after six hours at the latest. You can obtain further information about installing the trailer electrics from a qualified specialist workshop, e.g. an authorized Mercedes-Benz Center.